I have automated investing turned on, some people want to manage their loans much more actively, I did not. My objective was to find something that I could put money into and let is grow gradually. You will probably notice the “Adjustment for Past-Due Notes”, be reminded that people do default on loans and there is always a risk of losing money. In general people have been good at repaying their loans, but things do happen. So far I have had 4 notes charged off, at the current pace I expect 5-6 per year. This however is where diversity is good, not all of your investments will be lucrative and not all will be a loss, with a mixture of notes you can increase your returns. 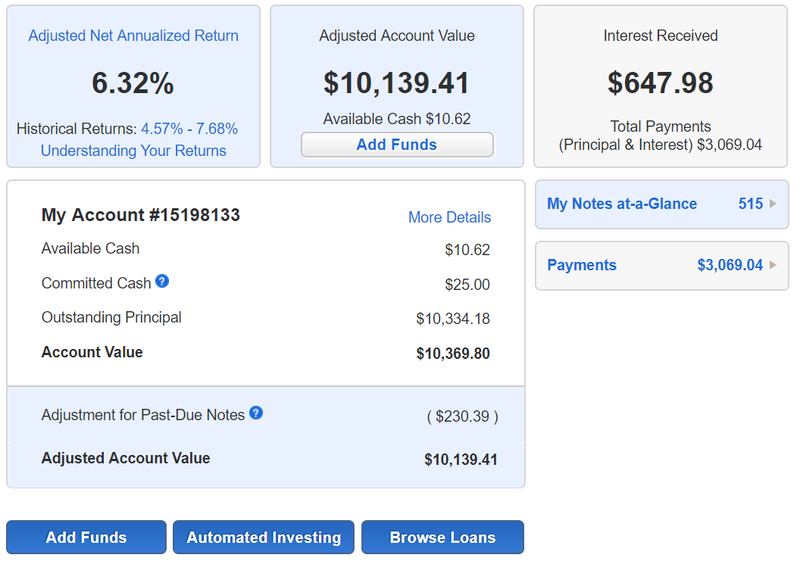 I only invest one note of $25 per loan through automated investing. If you are interested in giving it a try, click here. I do get a $50 referral credit 😊!